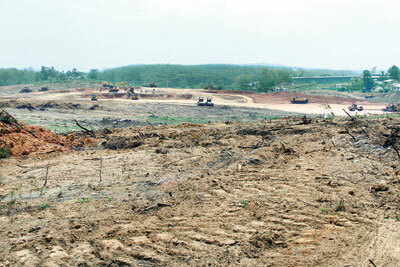 Controversial businessman Nandana Lokuwithana has begun clearing the land in Horana where he proposes to set up a tyre factory, even before the lease agreement with the Board of Investment (BOI) is signed. Meanwhile, President Maithripala Sirisena has sent a note via the Prime Minister’s office to the Cabinet Committee on Economic Management (CCEM) flagging some concerns regarding the project. It points to the losses the BOI will incur in leasing out 100 acres to Mr. Lokuwithana’s Rigid Tyre Corporation (Pvt) Ltd at a fraction of the investment agency’s floor price for the land. It also observes that other investors have been allocated land at higher prices and underscores the importance of a level-playing field. Mr. Lokuwithana proposes to set up a tyre factory in the BOI’s Wagawatte Industrial Zone (WIZ) with a US$ 75 million investment. Rigid Tyre will use technology from Marangoni of Italy under a partnership agreement signed in September. There will be no joint venture company and the full financial contribution will be from Mr. Lokuwithana, who bought the Ceylon Steel Corporation (CSC) in 2009 and has business interests in Dubai. Around 3,000 jobs have been promised (although official papers have placed the number closer to 1,000). However, the deal that the Government — through the Development Strategies Ministry — is negotiating for Mr. Lokuwithana has raised serious questions. Among other things, it will grant him a 99-year lease on 100 acres of land for an annual rent of just 100 rupees an acre. The BOI’s prevailing policy is to limit leases to 50 years. The company will receive an income tax holiday of 12 years after which a preferential rate of 15 percent will be levied, despite the BOI’s powers to grant such concessions being suspended in April 2016. 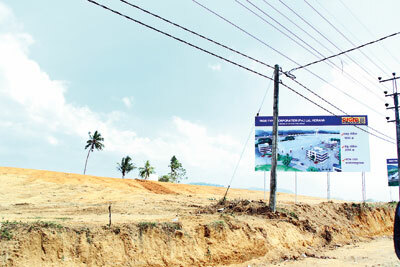 The CCEM has also sanctioned a massive discount on the lease premium owed for the Wagawatte property. Instead of paying the amount estimated by the BOI, Mr. Lokuwithana is getting the land at rates calculated by the Government’s Valuation Department. The tycoon will, thus, deposit just Rs. 170 million upfront as a lease premium and a nominal rent of Rs. 10,000 a year. The BOI charges a premium of US$ 40,000 (Rs. 6 million) an acre for a 50-year lease of WIZ land. The annual ground rent per acre at WIZ is US$ 3,850 (around Rs 578,000). Questions have also been raised in some quarters over the source of Mr. Lokuwithana’s funds, particularly as he was known to be a vanguard of the previous regime and because he figures in the Panama Papers released by the International Consortium of International Journalists (ICIJ) — leaked documents detailing financial and attorney-client information for thousands of offshore entities. Representatives for the CSC claimed this week that they were clearing the Wagawatte property on permission granted by the BOI. They also said Mr. Lokuwithana’s finances were clean, that they had been channelled through reputed banks and that he ran eight successful companies in Dubai. These included a catering service and a construction firm that has carried out building projects for the Emirates Government and Emirati royalty. The relevant BOI property in Wagawatte lay unused for 18 years before it was identified for the tyre factory, continued Taya F Diaz, the company’s Head of Communications. Around 35 acres of it is marshland while another section is rocky. It requires “micro-piling” for the land to be usable. The company will spend its own funds for this, as well as in the provision of water, electricity and an internal road network. “The BOI had no money or resources, an estimated Rs. 450 to 500 million, to develop this land the way and investor would want,” said Mr. Diaz, explaining that this was why the administration had agreed to lease it out at rates determined by the Government Valuer. He also said the annual rental was meant to be nominal. He produced a photocopy of a cheque for Rs. 170 million that CSC had made out to the BOI as the lease premium. Mr. Diaz said his employer would “never deny his closeness with the previous regime”. “He always says, ‘I shared their vision’,” he said. But he also claimed that Mr. Lokuwithana had first met Mahinda Rajapaksa, the former President, in 2008-09. On January 5, a foundation stone was laid for the factory with the attendance of Prime Minister Ranil Wickremesinghe and several other ministers. The date for the ceremony was decided by the President’s office while all promotional material had also passed through his staff.